…when shriveled dandelion bits litter my kitchen, and desk, and float in random cups half-full with water. Every single time my 3 year old brings me a fistful of fuzzy yellow flowers, I can hardly bear to throw them away, even after they have wilted beyond recognition. Picking dandelion blossoms is a childhood rite of passage. I used to consider the predictable yellow flowers popping up each spring to be a nuisance. Something to be eliminated or (*gasp*) even sprayed. But I have seriously changed my tune, even before I had grubby little toddler fingers picking them for mama. I’ve learned how to enjoy lambs quarters, purslane, prairie mushrooms (no, NOT the hallucenogenic kind, thankyouverymuch. ), and yes, even dandelions. 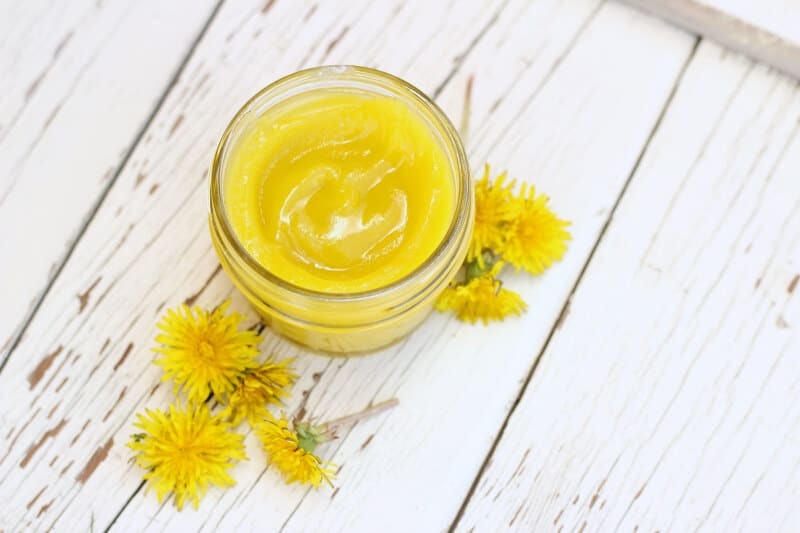 Although there are tons of ways to eat the things, I have been especially interested in dandelion’s muscle soothing properties lately and wanted to make a dandelion salve for those long days spent outside working in the garden or fixing fence. The Prairie Kids were THRILLED to have a new purpose in their incessant dandelion harvesting, and it only took us a few minutes to fill a colander with enough dandelion blossoms to make a big batch of muscle salve. Allow the dandelions flowers to dry overnight to remove a bit of the moisture content, then add the wilted flowers and olive oil to a small saucepan and gently bring to a very slow simmer. Allow the flowers and oil to gently simmer for 2-3 hours. 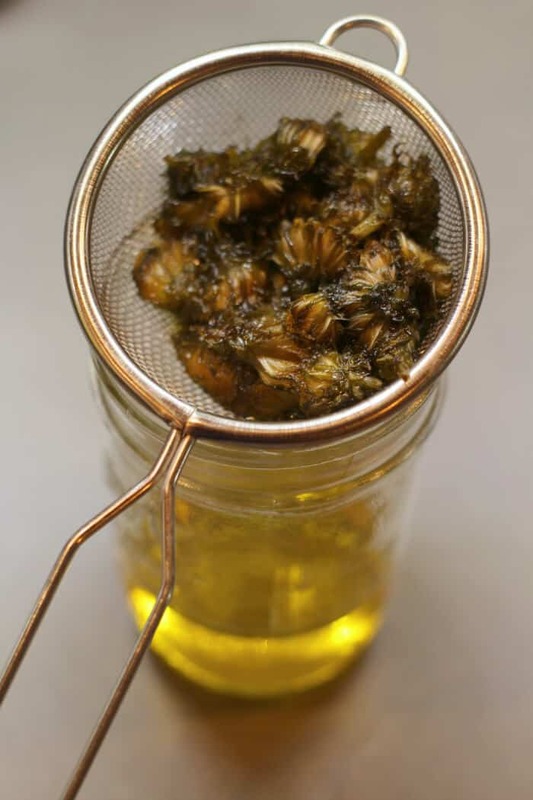 Strain out the flowers, and store the finished oil in a cool, dark place. In a double boiler*, gently heat the dandelion oil and beeswax pellets. Stir over low heat until the beeswax is fully melted. Remove from the heat, and allow to cool for several minutes, then add the essential oils (if using). 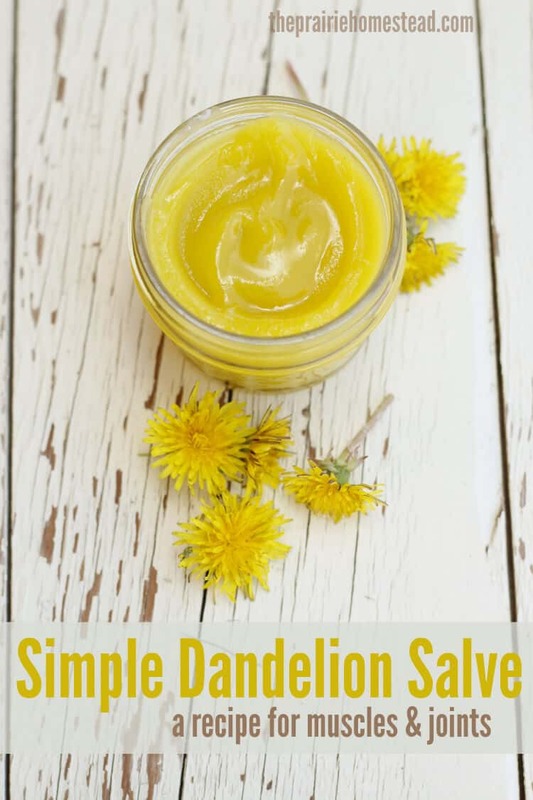 Pour into small glass jars or tins, and allow the dandelion salve to set up for several hours. Store in a cool, dry place and rub onto joints and muscles after those long homestead work days. *If you don’t have a double boiler, simply place an oven-safe bowl or cup in a small saucepan filled with water, and melt the beeswax/oil mixture in the bowl or cup. IMPORTANT: Please only pick dandelions from areas you know have not been sprayed with herbicides. 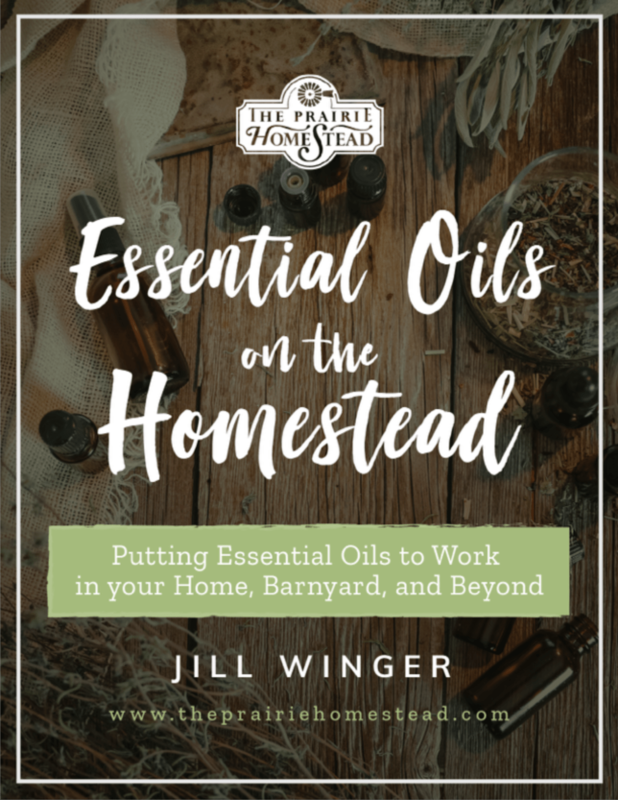 I added marjoram and white fir essential oils to this recipe, as they are known for their ability to soothe muscles and joints. However, you can omit them if you like, or substitute other oils instead (such as lavender, peppermint, etc). These are my favorite essential oils in the whole wide world. For a firmer salve, slightly increase the beeswax. For a softer salve, slightly decrease the beeswax. I don’t have an exact shelf-life for this homemade salve, but I know my other versions generally last quite a while (3+ months). 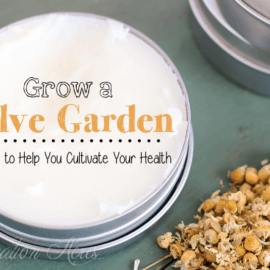 Check out my Gardener’s Hand Cream Recipe if your hands are feeling extra dry and crusty after a day in the garden. And if you want to play around with more herbal salves, here’s a recipe for Homemade Comfrey Salve. Love this! A fantastic idea for those pesky dandelions. My kids bring me lots of these flowers as well–now they can have another purpose! Definitely going to try this. Thanks! I love the sunny colour, and will definitely be trying this on my massage clients! I am really curious how much benefit you would get from just the dandelion flowers. The oil you added will obviously get the job done. It’s so pretty and yellow! I started an oil infusion a couple days ago too. Anxious to see how it comes out! Thanks for sharing! Melanie I use it just about every day and I’m hooked. I have a tailbone that has been broken for 8 years (there’s no fix) and this salve helps! Hubby had shoulder repair he swears by it. We use clove, ginger, and peppermint for our oils because they are healing oils. 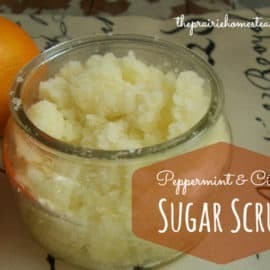 Wondering if this would also work with coconut oil instead of olive or apricot oil? Jill, love my dandelions. Thanks for another idea to use them. I’ve got some dried blossoms macerating in oil as we speak. I was going to make a balm for sunburn with it. They are so versatile. Great idea! Never thought about using it for sunburns! Jill, does the dandelion oil infusion keep indefinitely? Then when beeswax is added have a shelf life? To be honest, I know salves like this won’t last forever, but I’ve personally never had any issues with spoilage, etc. And I’ve kept similar recipes around for a long time. Vitamin E oil will act as a natural preservative and extend the shelf life. Vitamin E oil will help lengthen shelf life and I also keep salves in the fridge. Does it leave a yellow tint on your skin? I can’t wait to try this. I love dandelions. So many uses. My kids love dandelions tea and my husband and I adore homemade dandelion wine. Guess we need to pick more dandelions. Great recipe. Can you share your wine recipe? Hey there, I work with a lot of medicinal plants, including dandelion, but have never heard of this use. Can you tell us where you got the idea? On the other hand, I can offer that yellow dock leaves when young are delicious, and the root is used as a mild laxative, a digestive bitter (along with dandelion), and for long-term liver health, included in some approaches to treating skin conditions through improving internal organ function. I’ve never heard of this use either. 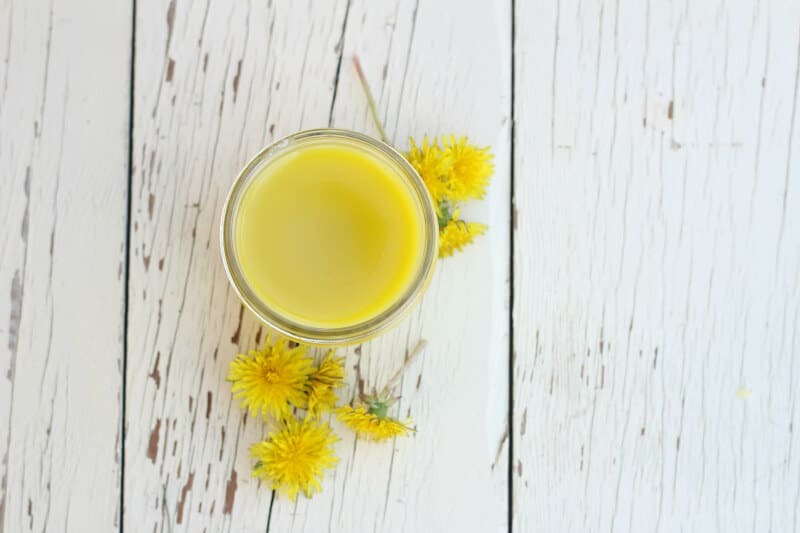 It is really only a pretty yellow oil, and a waste of dandelions. Dandelion doesn’t have any properties that would make it beneficial for inflammation or external pain. I have made this and used this past year for arthritis in knees and I no longer need to wear knee braces to help and also I had gave to my sister in laws and they use it for trouble with their feet. My mom also uses on her arthritis in her hands and no longer pain or stiffness. It might not work or you but for our family I have to make a quart jar to last us. Don’t knock it till ya try it. 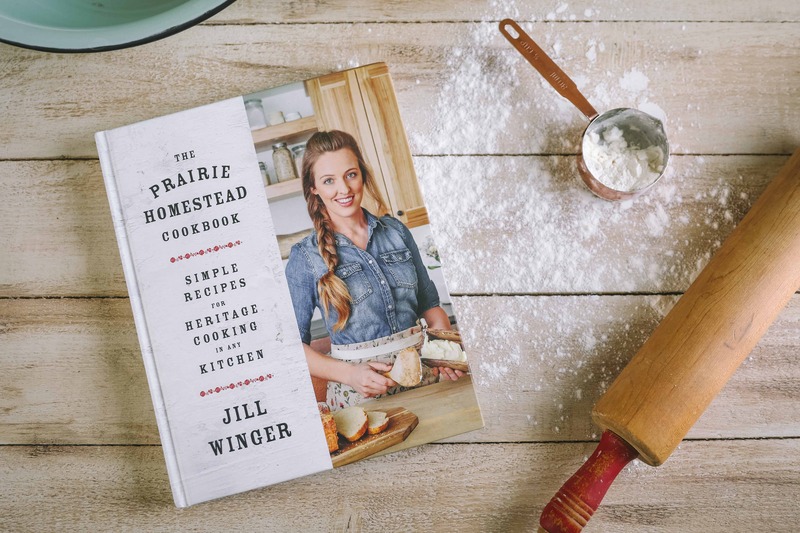 Hey Jill – thanks for posting this recipe. 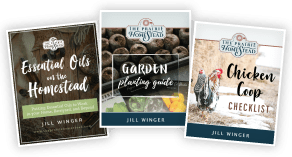 I am doing this now…quick question – I noticed the recipe called for olive oil or lighter oils like apricot or almond oil. I only have organic EVOO on hand. Will this be ok? Love your site by the way! Thanks for this recipe – can’t wait to try it! 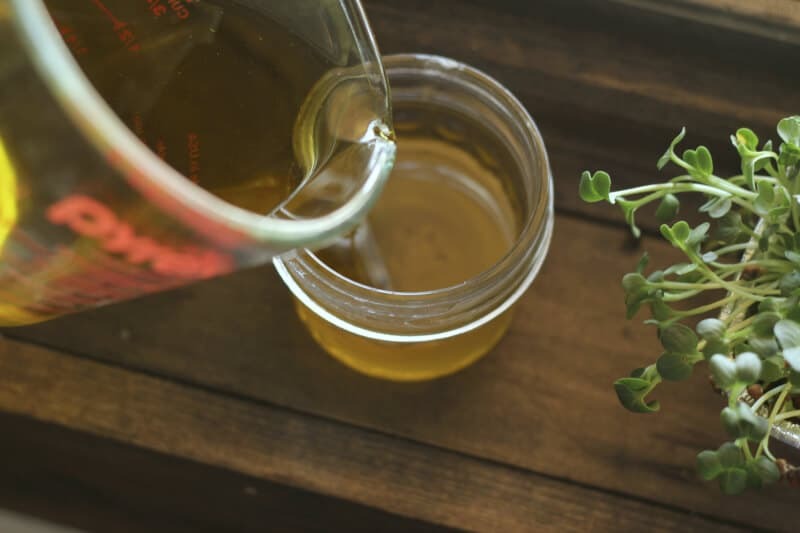 Do you have a homestead topical remedy recipe for itchy rashes? Also, in light of the recent widespread reports about the adulteration of the olive oil coming to North America (69% of olive oil in stores and restaurants is either simply fake, or mixed with unhealthy oils like soy or canola – manipulated by the Italian mob industry), I believe it’s wise to use an alternate, known healthful oil, from trusted sources, in all our recipes. To soothe skin, I would suggest a salve/cream made with peppermint or lavender essential oils. 🙂 And yes– I am aware of the olive oil issues– stay tuned for a super exciting giveaway I have coming up on that very topic! Can you just infuse the dandelions in coconut oil? Since it hardens just below room temperature, you wouldn’t need the beeswax? Yes, you could infuse in coconut oil too. It would just result in a softer end product. If dandelions were sprayed last year, can the new crop be used this year? I suppose it would depend on the herbicide, but I would think it would be OK.
Do the flowers have to be open for it to work best or are they ok closed up? Very neat– I’m so so happy it’s helped him! Hey, yellow dock root is healthy too!! Don’t waste it. Could i mix almond and olive oil for the infusion? My husband broke his foot and had pins and all in his foot a couple years ago and he swore by me rubbing it on there, being careful by the pins and it took his most of his pain away. And currently he ruptured 4 discs in his lower back and again swears by it. I rub it on 2 times a day and he can actually move around without having stabbing pain. do you think you could use coconut oil? 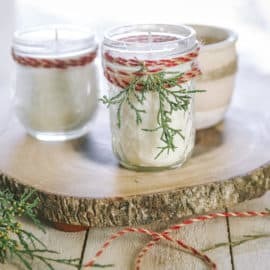 I would like to make some salve for Christmas gifts. Does anyone know if you can leave the dandelions out to try or freeze them until later in the year. I would prefer to make it closer to Christmas to make sure that it won’t go bad. Teresa, I am wondering the same if dandelions can be frozen and then thawed out. I would love to try and make this in say November to hand out at Christmas. Does anyone know? If you dry the herbs well they can last for years, I believe. I am allergic to beeswax. Will coconut oil work instead?? Yellow dock root makes a great companion to dandelion root for a gall bladder/liver detox tincture – I make it and use it daily. I also steam the leaves and throw out the water that the oxalic acid has leached into and put them in my raw dandelion leaf smoothie with some chives from my garden, avacado, bone broth, spices, salt, & nutritional yeast – yummy and very invigorating with tons of nutrients. 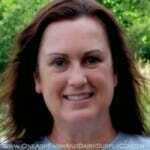 Good to know Anne– thanks for sharing! I made this last week and have had amazing results. I clean houses (3,000 to 5,000 sf) so I do a lot of bending and stretching all day. My knees and back take a beating but this salve made an incredible difference. I rubbed it on before I went to work and the pain was significantly reduced. I now have a section in my yard specifically identified as the dandelion garden! Thank you for sharing this wonderful recipe! How much did it make? I only made 1/4 of the recipe and that gave me a very full 5 ounce jar of salve plus a small travel size jar to keep in my cleaning tote. This is wonderful stuff! I am so glad it helped you– yay! How much does this recipe make? I’d like to make a bunch for gifts, etc. Thank you!! Great blog and thank you for all your information. If I may suggest one thing. When using the “hot mehtod” of oil infusion, you should never put the oil and “herb” in direct heat/flame. Instead you should use a double boiler or a glass bowl over boiling water making sure the water never touches the glass. Thank you so much for the info ? Hi. I made a muscle rub with infused from dandelions. It had tea tree oil in it. I can’t find the recipe. What do you think about tea tree oil? I have a degenerative disease in my spine. This save heps. I VN started putting it on my feet at night when I go to bed. Makes a big difference. I ant less pain meds. Any suggestions would be appreciated. I attend physical therapy. Are there any concerns about the dandelions not being clean enough to use due to contact with animals? For instance we have a dog and 8 free ranging chickens roaming around our yard. Do you recommend only using dandelions from a relatively animal free (though wild deer and other critters abound..) portion of the yard? I grew up with the old wive’s tale (and accompanying placebo effect) that dock leaves are an effective sting relief for a run in with stinging nettles. Apparently that is disputed, but it always seemed to make me feel better. Great post and essential oil blend ? Yellow Dock is amazing for skim ailments like rashes-(poison oak), eczema, psoriasis as well as a tonic and lymphatic support! I didn’t see grapeseed oil mentioned as a carrier. I’ve always used this as it has no odor of its own & has a long shelf life. It used to be inexpensive but I notice the price has increased lately. Also, how about adding arnica to the salve for pain relief? Am trying this tomorrow but I only had a small amount of dandelions in my garden but a quick look over my fence and spotted loads in my neighbours garden. Needless to say but my neighbours are now certain I am a witch!! Hi! You mentioned it has anti-inflammatory properties. Would that work on inflammation on the inside of the body too? If so, what is your recipe for getting it into the body? Dandelion is completely edible, blossom to root. You can make tea, wine, coffee substitute, and eat the leaves as any green, like collards or kale. It can be tinctured in alcohol or glycerin. Get a few books on herbs from the library. I’m wilting dandelion flowers as I write this. 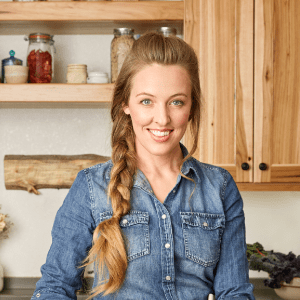 I can hardly wait to try your recipe! I was taught to let the herbs infuse in the sun rather than in a crock pot. The crockpot seems much easier and faster! Will the medicinal properties be the same either way? Can the simmer be done in a crockpot? For how long? I would like to make this year round will Dandelion root and leaf do the same thing? Yellowdock is a liver tonic. Like burdock, milk thistle and the beloved dandelions. A crockpot is even easier than stovetop for oil infusions. Would this be the same amount of blossoms for calendula salve? How much St Johns Wort would I use instead, as thats a barky, root type thing?